SAT TEST – The primary standardized test required for college admission. (1) READING section: 65 minutes long, comprising 52 questions, (2) WRITING section: 35 minutes long, comprising 44 questions, (3) MATH section: 25 minutes long, comprising 20 questions requiring no calculator in addition to a 55 minutes long section, comprising 38 questions, requiring a calculator. (4) Optional Essay: One prompt, 50 minutes long. The length of total test: 3hours and 45minutes. To provide colleges with an estimate of each student’s potential for success in college. The SAT test measures critical thinking/reading/writing skills, and evaluates how students analyze and solve problems. The SAT Test dates are: January, March, May, June, October, November and December of each year. Students have to register through the College Board to take the test at a near approved test-centers. Each test date has a specific registration deadline. Students enroll in our SAT TEST PREP course in January of their junior year. Classes begin the last weekend of January and continue for the next 12/13 weeks, meeting once a week, usually over the weekend for three hours – 1 ½ hour math and 1 ½ hour verbal. The SAT class size is limited to 15-18 students and students are organized into classes according to their skill-level determined by the PSAT test scores/school GPA. 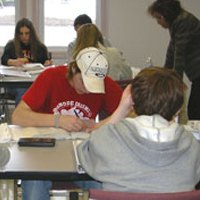 Our January SAT classes prepare students to take the SAT Tests both in March and May of the junior year. If a student wishes to re-take the test in October, we offer FREE summer classes to keep their skills sharp through targeted test practice sessions. New students who do not enroll during our January session can take advantage of our SAT summer classes. Sessions begin mid-July, meet once a week, over the weekend, for three hours and prepare students to take their SAT test in October of the senior year. In order to prepare students for the verbal portion of the SAT test, students are taught specific strategies of how to handle each section of the test. In order to prepare students for the “reading” portion of the test, students are provided explicit details of how to read, highlight, comprehend and answer the questions. This is important since students need to make careful use of evidence as they read; some passages will ask students to also analyze data represented graphically in tables, graphs and charts. Since students are also tested in vocabulary-in-context, students learn vocabulary through proven methods other than the mere memorization of words. Students are also provided a thorough overview of grammar/sentence structure and writing skills to prepare them for the “writing” portion of the test. Finally, students learn important skills of how to write the optional essay. "The Chaudary's are excellent with children and have a great way of working with them." "Latif" said Blake, "is really top notch in math. "Attiya is superb at knowing a young person's talents, abilities and weaknesses. Some youngsters are not good testers. She teaches children not only how to take a test but how to use time efficiently, how to study and in general get ready for life"
"Thanks to your skill and dedication, Zachary was able to achieve scores on his SAT’s that opened many doors. Even more incredible was that Zachary truly enjoyed every minute with you both. You have great skill in connecting with these students, and they feel valued by you." "Believe it or not, I made new friends and laughed a lot, all the while raising my SAT score by about 400 points! " I am writing this letter to convey my heartfelt appreciation for all the help and guidance both of you have given me throughout my college admissions process. From PSATS, to SATS, to college essays, I truly believe I would not have been able to achieve the success I have without both of you. After getting a relatively low score on the PSATS I was very scared about my abilities to do well on the SAT, but with the help of of your classes, I was ultimately able to receive a score of 750+ on every section of the SAT and a perfect score of 800 on the critical reading section - the section I most struggled with in the beginning...near me." Serving students from and near the following states: Massachusetts,MA, Rhode Island,RI, New Hampshire,NH, Maine, ME, and Connecticut,CT. Communities in and near: Attleboro, Barrington, Boston, Brookline, Cumberland, Cranston, Dedham, Foxboro, Framingham, Franklin, Johnston, Kingston, Lincoln, Mansfield, Manville, Milford, Natick, Needham, Newport, Newton, Norton, North Attleboro, North Kingston, North Smithfield, Norwood, Pawtucket, Providence, Plainville, Seekonk, Sharon, Smithfield, Chelmsford, Sudbury, Lowell, Nashua, Andover, Lexington,Shrewsbury,Taunton, Walpole, Warwick, Wayland, Wellesley, Weston, Westwood, Woonsocket, Worcester, Wrentham, and many other near New England communities.